Jean-Marc Brocard came from a humble background working as a tenant farmer in Chaudenay. His introduction to wines came about when he married his soul mate Claudine in the early 1970s. Hailing from the neighbouring St-Bris-le-Vineau, Claudine is the daughter of a wine grower whose family had a history in wine growing dating back to the 1500s. His father-in-law’s wedding gift of a hectare of land, from which Jean-Marc successfully produced his first vintage around 1973, was his first foray into wine production. Despite the economic depression after the world war and the long periods of stagnation in Chablis that followed phylloxera destruction all through the 20th century, he went with his gut feel to unlock the unexplored potential in this region. Living so close to Chablis gave him an added advantage of studying the ins and outs of wine growing, before he established what others could not envision - that this region, ever since deserted after world war, indeed had a lot of potential to be revived! 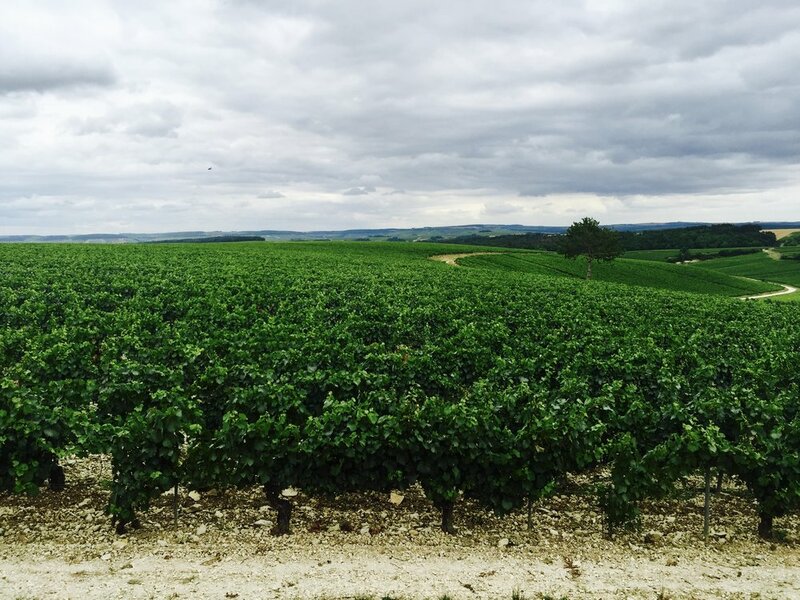 This vision is what helped the brand to become a pioneer Chablis producer. Gradually over the next few years, he started renting plots of lands from wine growers and building his wine production. At the same time, Jean-Marc also studied how to position his production. He saw a huge demand in England for French wines where he found his gap to plug; an export strategy focused on the UK, that worked very favourably to build his supply chain. Over the next couple of decades, his returns gave him requisite financial stability to start buying out the vineyards that he had rented from wine growers. Today the family works across 200 hectares of land in Chablis, more than 100 h of which he owns making them one of the biggest family owned producers in Chablis. I had the pleasure of exploring their sprawling estate, one of the biggest in Chablis I have seen so far and it was an absolute delight meeting up with Julian Brocard on a recent visit with Bourgogne Wine Board. Son of Jean-Marc, he has since, taken over day-to-day running of the estate as well oversees many strategic operations of the domain. His superior expertise on the technical side has added a unique dimension to the business. Joining his father, at the end of 1990s, he brought in sweeping changes incorporating highly researched sustainable forms of viticulture. Using his experience gained from working in the automotive industry in Paris, he joined the viticultural side of the business, working his way up the domain ladder and over the next decade, successfully converted 50 hectares of the total land (with more under way) under their domain certified as Organic and Biodynamic. According to Julian, “The change we have noticed over the years after moving over from conventional methods is evidenced in the quality of our wines. There is more harmony of the vines with the soil and nature and we are able to maintain a consistent degree of freshness in our wines even in difficult years. Chablis is a tough terrain to achieve climatic stability. Vineyards with conventional methods see huge fluctuations in the quality of grapes, year on year when the weather changes. If there is high humidity one year, chardonnay turns less fruity and more vegetal. If there is a dry season, the grape production multiplies excessively, gaining excessive juice and fruitiness at the cost of concentration. With biodynamic vine life, the soil attains the perfect level of harmony with the vine system and a two-way interactive ecosystem begins to work over time. Hence the vines do not struggle when there are extreme climatic fluctuations. The result is that the grapes bear a consistent expression year on year”. But the challenge of turning organic and biodynamic that started in 1997 was a mighty one and it took more than 10 years to realise their dreams during which many a times, there were moments when Julian smilingly reminisces his father speaking aloud his fears of losing it all and turning nearly bankrupt, with the burgeoning costs and the multiple failures they encountered through this tough phase. But Julian’s relentless and patient pursuit to quality convinced his father that this was the way forward for sustainability in the long run. It is only a decade later in 2007, that the estate turned around, with this new pedigree which has since, not only proved useful for their sustenance but also helped in leading the way for other Chablis producers who see J M Brocard as inspirational brand that models itself on an organic and biodynamic lifestyle, a revolution that is now spreading across France and many parts of Europe. Julian has a brother who is a full time negociant in Dijon. His sister works in St-Brie in the vineyards that belong to their mum. With matriarchal inheritance dominating the culture, she follows her mother taking up the vineyard role at St-Brie. A working lunch with Julian and his lovely wife Laurence, was a great occasion to understand the real-life dynamics of the Brocard household, which works with utmost dedication to find the perfect balance between personal and professional goals. Laurence, a full time mother of two active kids is the Ambassador for the estate promoting the wines across UK and US. Although French by origin, she and her siblings have lived and worked in England for many years (southern coast being their favourite region!) and are comfortably bilingual, switching between French and English with great ease. Representing the Brocard heritage with her distinguished grace, she is the perfect candidate to represent the wines for English speaking countries. Her brother Sebastien who welcomed us at the domain is also an extremely friendly and witty gentleman who seeks any excuse to bring out his love for English heritage! He now works on the estate retail operations. The domain promotes wine tourism and also offers tourist accomodations and a 4 star bed and breakfast, I was informed. Lunches are also provided at the Table de Jean-Marc Brocard. Further discussions revealed some of the changes they have undergone in the winery front, following the partial conversion to organic and biodynamic so as to reflect the purity of the wines. A nearly complete withdrawal of new oak serves their philosophy of producing wines as fresh and pure displaying their terroir expression. Rarely is new oak used and that too only for their Petit Chablis and Chablis Village wines, where the barrels when used are the bigger 15hl, 25hl or 50hl (foudres) capacity. Premier and Grand Crus as a matter of practise only witness old oak. Concrete eggs are also used, the sizes vary between 6 to 15 hl. The reasons for the introduction are manifold. Firstly, it helps in promoting micro oxygenation and softening the wines. Apart from this, they also help keep the lees stay fresh for longer with the rounded shape of the egg promoting uniform circulation of lees flavours, without the need to do frequent stirring or racking, adding more complex notes as fermentation progresses. This in turns makes richer and textured wines without adding undue oak and smoky flavours. These eggs have brought back the ancient Roman amphorae philosophy of wine making aimed at expressing terroir. Also, the Brocard philosophy incorporate letting their wines stay on the lees for as long as possible till the wine is bottled. Premier Cru and Grand Cru and Biodynamic Crus : aged on the lees for 12-14 months and then stored in bottles for 8 months before release. The 2016 vintage was an overall very small and a stressed vintage due to frost playing major havoc on the vines and hence the lees ageing is far less for this vintage to keep the freshness and energy alive on the wines. Most of the organic wines were lost in the 2016 vintage and so ageing for the balance wines that were produced have been limited to a short period of around 8 months for the Chablis wines. Also its been decided that for this vintage, Grand Crus and Premier Crus also will be bottled earlier by 2-3 months atleast. The reason being that they want to retain the freshness in the wines and not age and tire them by letting them stay on lees for too long. These will also be released earlier than usual vintages. All of the wines are available in the UK through Berkmann’s and The Wine Society. A very memorable tasting indeed. Many thanks to JM Brocard team for hosting me!